Ploceus subaureus Smith 1839 and P. xanthops Hartlaub 1862 have had confusing English names, especially since Golden Weaver in southern Africa generally refers to P. xanthops and in eastern Africa it refers P. subaureus. There have been many variations of the names of both species. The current International Ornithological Congress names are Eastern Golden Weaver and Holub's Golden Weaver respectively, and the SA list committee is deciding if it should follow this or not. Are there guidelines that could be used to decide on the names for these two weavers? (1) The earliest English names that were used could help. The Latin names (of different races) of P. subaureus were used for several decades after it was described. The first English name I have found was Algoa-Bay Weaverbird (Gurney 1873), named after its type locality. 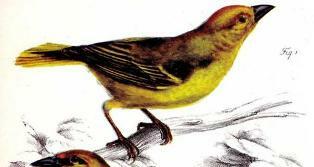 Other names used were: Canary-coloured Weaver Bird (Layard 1884), Yellow Weaver Bird (Stark 1900), and Bohndorff's Golden Weaver, Mnana Golden Weaver or Smith's Golden Weaver (Shelley 1905). 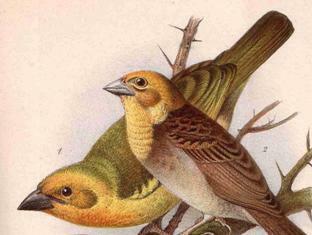 For P. xanthops the English names used by 1905 were: Golden-faced Weaver Bird (Layard 1884), Jameson's Weaver (Jameson 1890 & Stark 1900), Yellow Weaver (Alexander 1899), and Hartlaub's Golden Weaver (Shelley 1905). So the early use of names for these two species are of little help - changes in the English names of birds is nothing new! (2) The meaning of their Latin names could help: subaureus means underparts yellow (Hockey et al. 2005) or golden (Jobling 1991). xanthops (Greek) means golden eye (Hockey et al. 2005) or yellow face or appearance (Jobling 1991). So the Latin names are of no help either. There is no simple way to decide on universal names for these species that will satisfy every one. Above: P. subaureus from Smith 1839; Right: P. xanthops from Reichenow 1886.